There is nothing more exciting than that moment when you can choose your kitchen design during a renovation. In fact, our director, Sarah, knows as she has been doing just that for her family’s ‘project’ home. However, it can be tricky to decide where to start and seriously think about what you need to do. 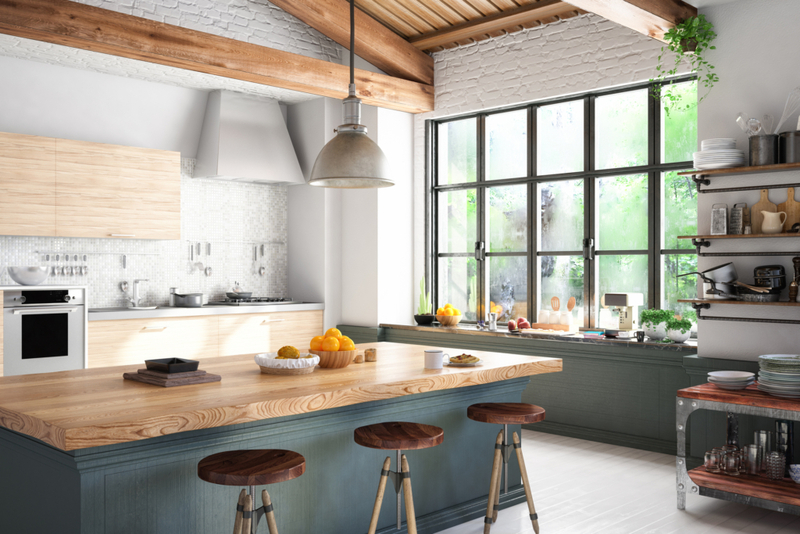 So follow our expert guide on how to choose your own design within budget to create the perfect kitchen for your home. This really should start when you’re packing away your existing kitchen to make room for building work for your new extension. Even if your current kitchen is remaining while building work gets underway, this room will need a thorough ‘spring clean’. This way, you can clear away your clutter and start considering exactly how much storage you will need. Think about how you can improve your existing space and create a clever working kitchen design. 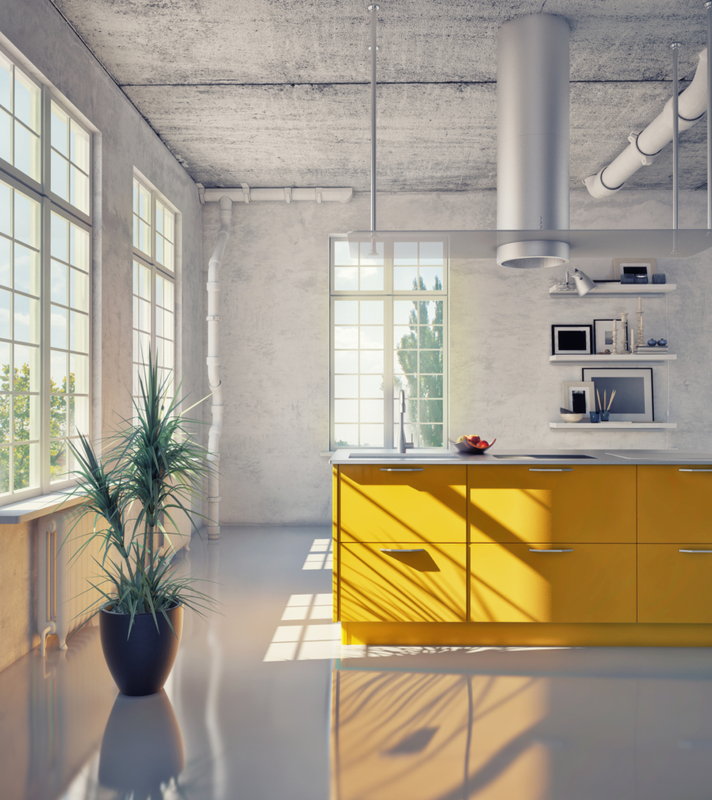 Storage, space, ergonomics and style are usually key contenders for improvement when a kitchen redesign is on the cards. What do you want to use this room for? Do you envisage a multifunctional area where you want to prepare meals, dine, entertain and relax on a comfy sofa? 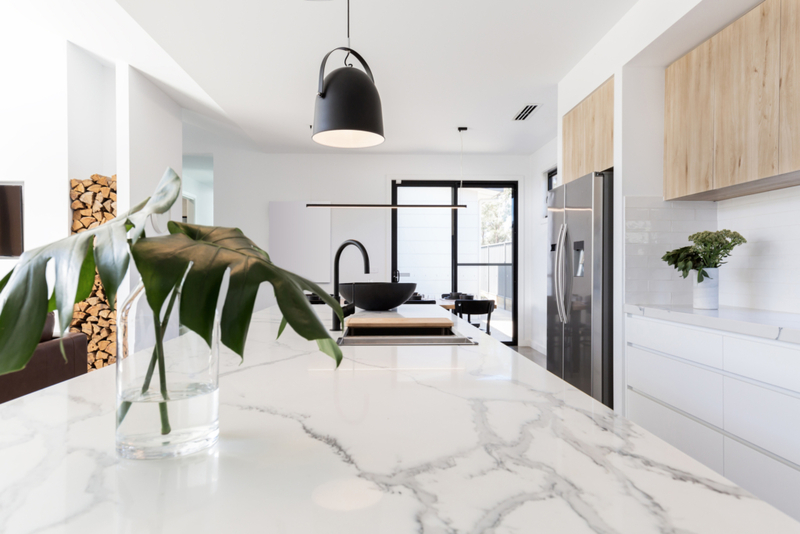 These days, open-plan kitchen design seems to be at the forefront of most people’s minds when building work is involved. If you choose to work with a kitchen designer, you may find they will come up with ideas you’ve never thought possible. They will also be able to steer you in the right direction when it comes to choosing everything which make a kitchen design. After all, this can range from lighting solutions to the location of your appliances. They can also advise on how many cabinets they think you might need and the layout to enable you to achieve an ergonomic kitchen design. Make sure you provide a clear idea of your maximum budget so your designer can work with this. Therefore, they will know whether you can afford high-end luxury appliances and a real stone worktop or perhaps you need to work to a more modest budget. Certain products will of course require plumbing so make sure you choose their location wisely. For example, perhaps a sink on the island unit may not be the best position? After all, do you really want friends and family to be greeted to your recycling drying on the drainer? At least, if you position your sink next to one wall, it won’t be so obvious. Place your recycling bins close by behind closed doors for a neater finish once everything has dried. So, once you’ve decided where to place your sink, why not position your dishwasher nearby? In an ideal world, your washing machine should be located in a utility room. This way, you won’t need to factor this appliance into your kitchen design. However, if you really need to include a washing machine in your kitchen design, make sure you choose a model with a low sound level. Therefore, pick a model, which spins under 59dB as this is normal conversation level. When it comes to heating, underfloor heating can be a preferred option especially as it can free up valuable wall space. Don’t forget to factor this into the installation before the kitchen floor has been laid. However, if money is going to be tight to realise your renovation dream, then some stylish radiators will look good and keep you feeling toasty. Have a chat with your heating engineer who will advise you on radiator sizes to ensure you buy models, which are large enough to serve your needs. For an open-plan kitchen design, you’ll find different lighting options will work well for certain areas. So, for a streamlined finish, you could choose spotlights, which will look stylish and provide ambient lighting overhead. In addition, pendant lights can look particularly striking above an island unit or your dining table. 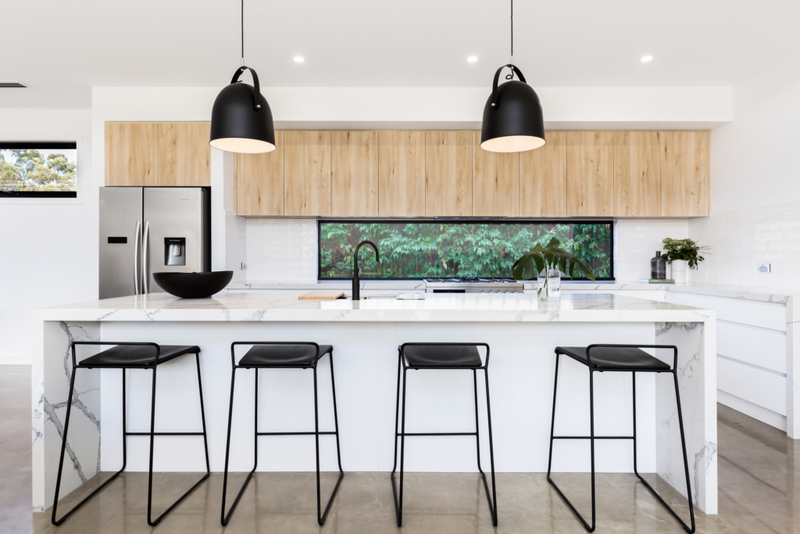 Task lighting can make the perfect choice under wall cabinets as this can light up your food prep areas whereas ambient lighting may suit your living area for a more relaxed feel. 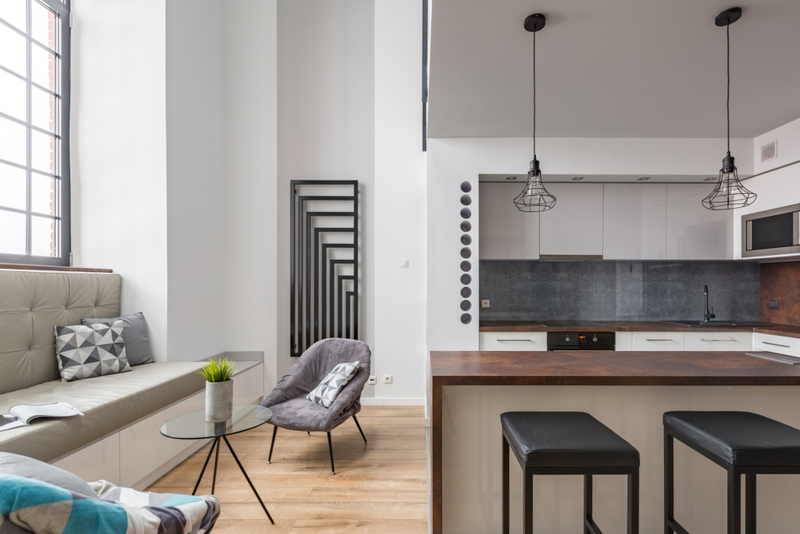 Ask your kitchen designer for their input. The kitchen style you choose will vary according to your needs and tastes. However, we suggest a classic finish can work well if you’re looking for a room that will stand the test of time. If not, a contemporary kitchen could be just what you’re looking for if you prefer a neat, streamlined finish. Either way, if you want to really enjoy the space you’re living in, make sure you choose a style that you personally like. For some, choosing a kitchen cabinet style can be daunting so why not search home and decor sites online for some styles. Our current favourites are Houzz and the US offering, Apartment Therapy. Otherwise, you could try visiting print magazine websites, from Ideal Home to House & Garden, for some kitchen design inspo. Your kitchen designer can also help to point you in the right direction. If extensive building work is required, chances are you’ll find you’re now working to a far tighter budget than first anticipated. Consider where to spend and where you can save and you’ll be delighted with the end result. Good quality cabinets will be key if you’re looking for a kitchen which will last for years to come. Bespoke kitchens make a fantastic option or perhaps opt for a kitchen brand which can provide cabinetry, which is particularly smart but comes as a range. Therefore, your costs will be lower but you still won’t sacrifice on style. Choose your appliances wisely – consider whether you will use all of the options which come with a state-of-the-art hob before deciding to splash the cash on an appliance which you’re simply going to use for stir-fries. If you live alone, a slim-line dishwasher may be just what you need and perhaps that American-style fridge-freezer will always remain nearly empty. Do you really require a stone worktop or will a high quality laminate version work just as well? At least this way, you can drop virtually anything on your surface and not feel obliged to wipe it up within seconds or risk marking the worktop. You can also make savings on the door handles or perhaps choose a modern push-pull design with no handles at all. With the flooring, perhaps a mock version may suit your needs rather than a stone or real wood floor? If you’ve extended your space to massive proportions, this will certainly help your bank balance, too. In addition, speak to your kitchen designer who should help you choose all the right options to suit your finances. Want to know how to find the right builder for your forthcoming renovation project? Follow our guide on How to find a good builder.